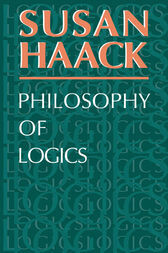 The first systematic exposition of all the central topics in the philosophy of logic, Susan Haack's book has established an international reputation (translated into five languages) for its accessibility, clarity, conciseness, orderliness, and range as well as for its thorough scholarship and careful analyses. Haack discusses the scope and purpose of logic, validity, truth-functions, quantification and ontology, names, descriptions, truth, truth-bearers, the set-theoretical and semantic paradoxes, and modality. She also explores the motivations for a whole range of non-classical systems of logic, including many-valued logics, fuzzy logic, moddal and tense logics, and relevance logics. Persupposing only an elementary knowledge of formal logic, this book includes many useful summary tables and diagrams, as well as a helpful glossary of technical terms. Wide-ranging, informative, and eminently readable, this book has proven a valuable resource for generations of students and scholars in a variety of disciplines outside philosophy needing guidance on the philosophy of logic.